If you live in Belmont Shore with young children, you've probably been to the little playground at Livingston Park. The Tot Lot Committee (T.L.C.) is working to improve and expand the playground for both toddlers and school age children alike (maybe you've seen their great t-shirts around town). On September 29, T.L.C. 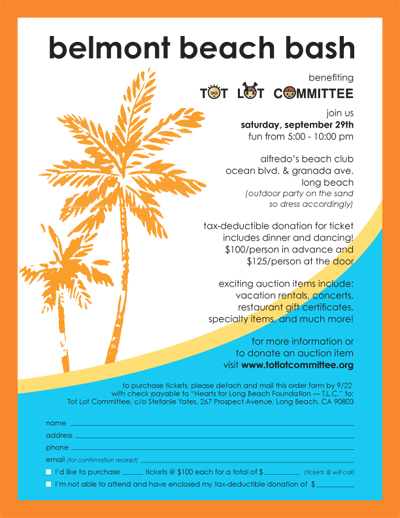 is hosting the Belmont Beach Bash to benefit the Livingston Tot Lot Renovation. The party takes place at Alfredo's Beach Club in Belmont Shore and includes a dinner and a silent auction (we've donated a portrait session...one more reason to attend). Get more info at the T.L.C. website.